UAW workers have voted to accept their four-year contract with Chrysler, but the ratification faced some serious opposition with only 56 percent of production workers and 51 percent of skilled trades workers approving the contract. From what we're told, many UAW members weren't happy about the new two-tier wage system that pays some manufacturing workers as little as $14 per hour and the lack of product commitment guarantees present in the GM contract. Still, they got it done. Got to give Chrysler that, right? Next up's Ford — let's see how that one goes. Full release from Chrysler after the jump. Chrysler LLC Confirms the United Auto Workers Ratification of the 2007 National Labor Agreement Agreement includes independent retiree health care trust Future competitiveness heightened by constructive agreement Auburn Hills, Mich. - Chrysler LLC today confirmed a new Chrysler-UAW 2007 national labor agreement, in response to the UAW's ratification results. 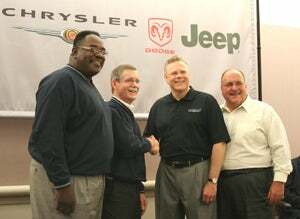 Chrysler and the UAW reached a tentative agreement on Wednesday, October 10, after three months of bargaining. "We are pleased that our UAW employees recognize that the new agreement meets the needs of the company and its employees by providing a framework to improve our long-term manufacturing competitiveness," said Tom LaSorda, Vice Chairman and President, Chrysler LLC. Chrysler LLC, headquartered in Auburn Hills, Mich., produces Chrysler, Jeep® , Dodge and Mopar ® brand vehicles and products. Total sales worldwide in 2006 were 2.7 million vehicles. Sales outside of North America were the highest in a decade with an increase of 15 percent over 2005. On the heels of the company's record product launch year (Chrysler launched 10 all-new vehicles in 2006), the company extended that streak with eight all-new products in 2007. Its produce lineup features some of the world's most recognizable vehicles, including the Chrysler 300, Jeep Commander and Dodge Charger. Chrysler is a unit of Cerberus Capital Management.